Part 1 on our recent Penang getaway is can be found here. No trip to the food capital of Malaysia will be complete without a proper food trail. We had our tummies filled and extremely happy in the 3 days we were there. We explored the Batu Ferringhi stretch on our first evening. The large variety of food available at our doorstep was more than what we could explore. 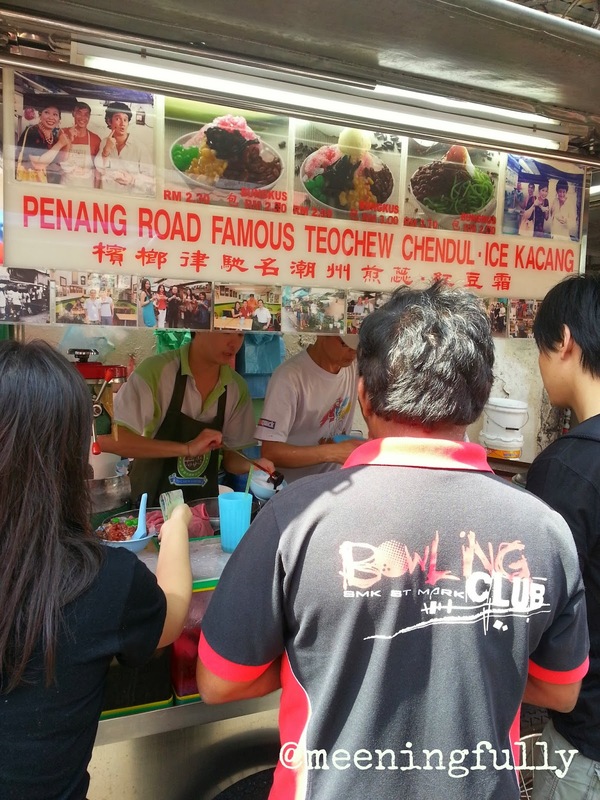 Long beach food centre, which is amazingly clean, with a good variety of local food. We were there slightly before the crowd came at about 6pm, hence the empty tables. 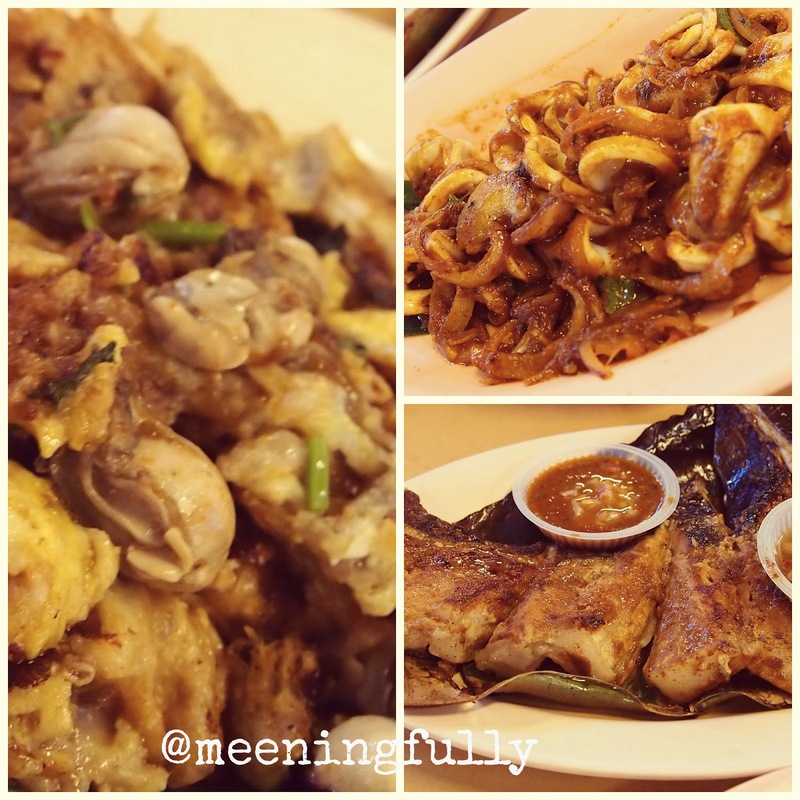 Clockwise: Orh-Luah (Oyster Omlette), Grilled Sambal Squid and Grilled Stingray. Loved the stingray as it was grilled with a little crunch, and the chili had a tinge of sourness that was a good complement to the former. Green Curry Chicken from the "cooked food" stall. The spices used were very flavorful, but I felt it could do better with more coconut. After dinner, we walked the night market and J surprisingly fell asleep in his stroller. That gave us the opportunity to do a considerable amount of shopping. We also took the chance to relax at the hotel's lounge for a drink. Something we have not done for a very long time. 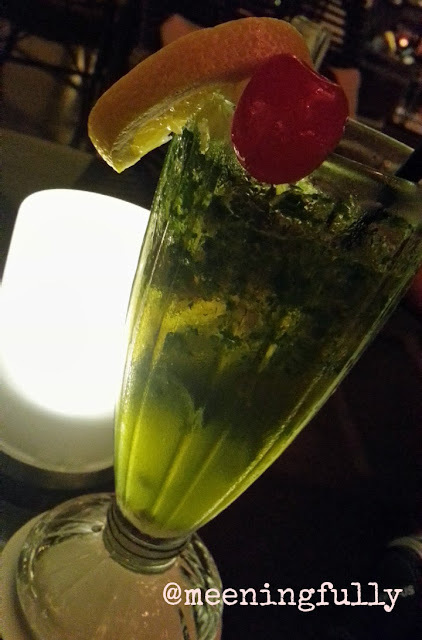 A rather tasty mojito, although I would have liked it with more alcohol. Felt peckish after our cocktails, we popped over to the food stall across the road from Holiday Inn (Beach Wing) and got ourselves some true malaysian goodness - beef ramli burger. 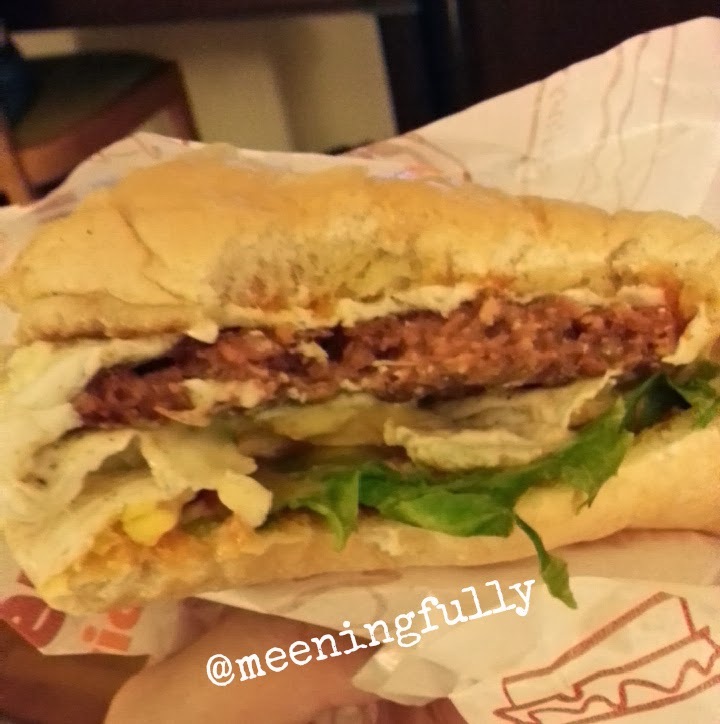 Ending Day 1 with supper of a beef ramli burger from the stall next to Holiday Inn's tower wing. Somehow, I don't know if it's just me, but the ramli burger tasted better than what we can find in Singapore. The beef patty was very tender, and not overdone. Day 2: We got a nice uncle to drive us around to see the sights of Penang, and also to look for yummy food to fill our stomachs. While we made the wrong decision to settle lunch at Gurney Plaza, that did not stop us from having more local delights. Apparently also a favorite of Puah Chu Kang and Rosie. 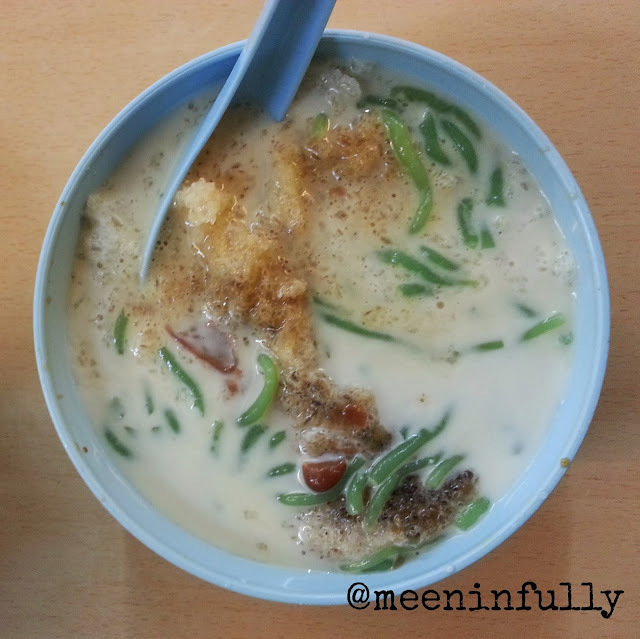 This is supposedly the best in Penang. Love the simple pleasure of queuing and slurping this up by the street. The famous Lorong Selamat Char Kway Teow, and it sure lives up to expectations. We packed this back to the hotel, and I bet it will taste so much better if we had it at the stall. Thumbs up for this, and just looking at the picture now is making me hungry! Equally as famous, this oyster omlette is from the stall across the road from the char kuay teow one. I liked it better than the kuay teow only because this was slightly less oily. Very tasty with little flour like those you find in Singapore. You are even allowed to buy this and eat it at the char kuay teow stall to complete your meal. Dinner was the Beach Corner Seafood Restaurant. It is right next to the Ship Restaurant along Batu Ferringhi. As it is just at the beach, further away from the main road, you might miss it. So do look out for the sign-post by the road. Although I must say their food leaves much to be desired. We were not exceptionally impressed, but maybe it is also because J wanted to explore rather than eat at the table.Plus, it was about to rain and we did not have an umbrella with us. So we had to take turns and gobbled our food down. 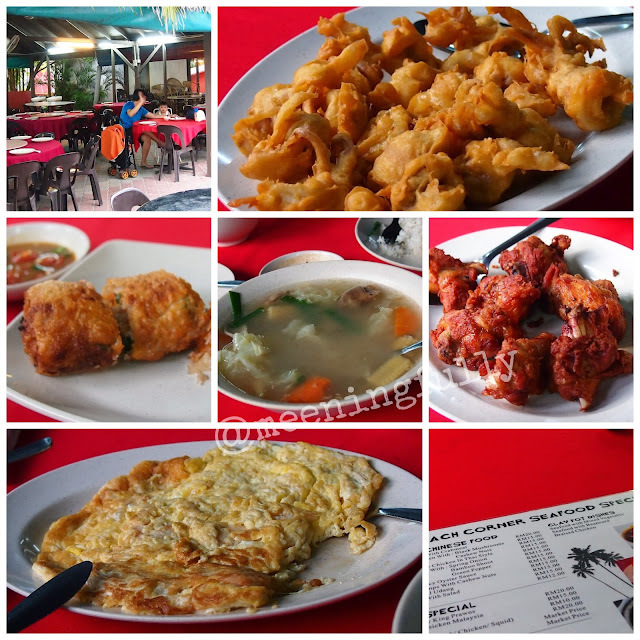 From left, clockwise: The restaurant ( we were very early), Fried Squid, Belachan Chicken, Prawn Omlette, Fried Spring Roll & Chicken Soup. Do not order the chicken soup... I found it rather bland, but was really more for J to have it with rice. Food aside, Beach Corner had a nice view. Pretty relaxing place to just sit back, enjoy the breeze and maybe a beer. Have you been to Penang? 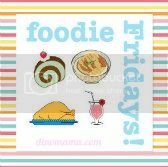 What are some of your favourite food?